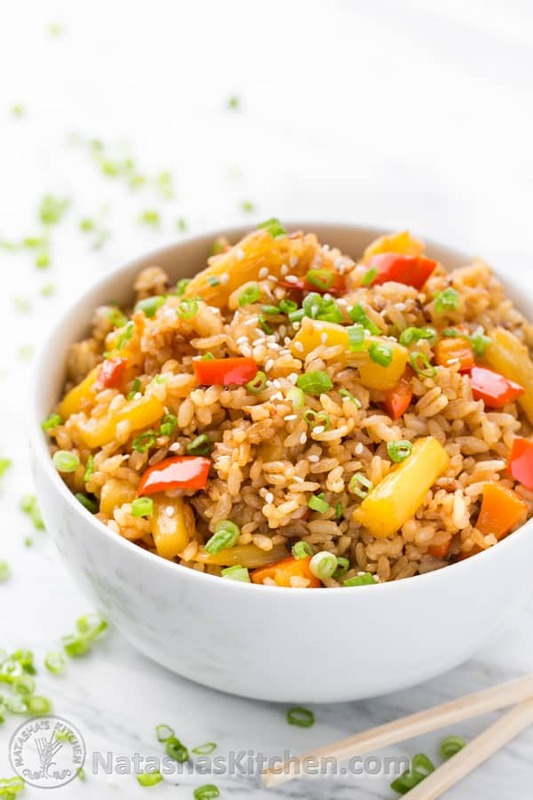 Here’s an easy and yummy lunch idea: pineapple fried rice. 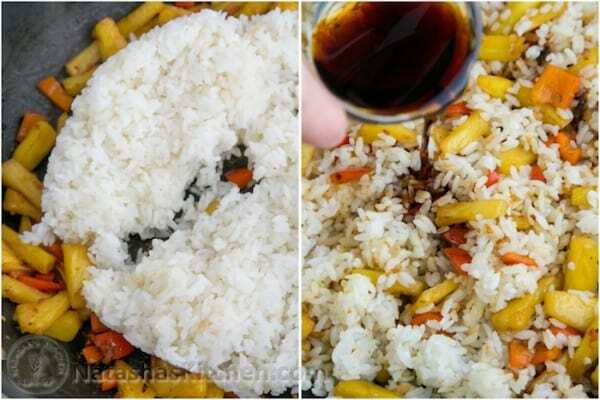 It is a great way to put some sparkle in your leftover rice. I’m a big fan of fried rice. Cooking over higher heat seals in all the natural flavors of the pineapple and leaves your rice with a subtle crispness. 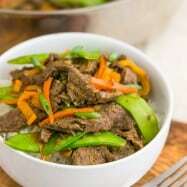 This stir-fry is a great meatless choice and everyone in my family loved it! Once your food hits the stove, it’s done in under 10 minutes. Quick and easy! 1. Rinse rice thoroughly and cook according to package instructions. We used a ricemaker and added 1 Tbsp butter and 1/4 tsp salt then let it cool completely. 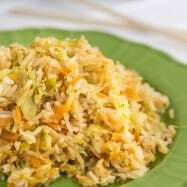 This works best with cooled, leftover rice. Don’t use warm or hot rice or it will get sticky. 2. Prep your vegetables before you fire up the stove. You won’t have time to chop in between cooking steps. 3. 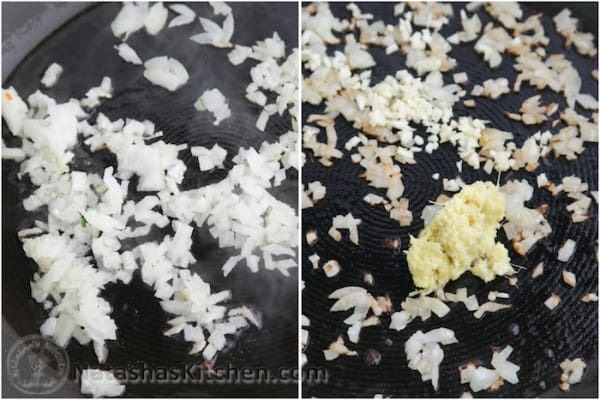 Heat a heavy-bottomed skillet or wok over medium heat, then swirl in 2 Tbsp oil. Add diced onion and cook about 1 minute or until softened. Next toss in pressed garlic and grated ginger and saute another minute, stirring constantly. 4. 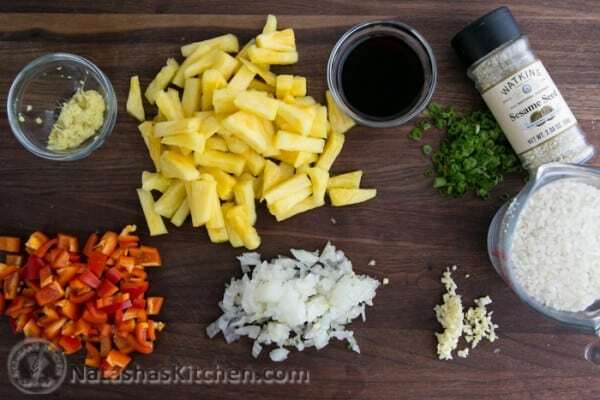 Increase heat to med/high and add diced bell pepper with pineapple and continue to saute everything for 3-5 minutes or until golden, stirring frequently. 5. Add 2 cups cooked rice and 1 1/2 to 2 Tbsp of soy sauce, or to taste. Continue to stir over the heat another minute or until soy sauce is well blended in. Turn off the heat stir in 1 tsp sesame oil, or to taste. I love how sesame oil. It gives Asian-inspired meals authentic flavor. 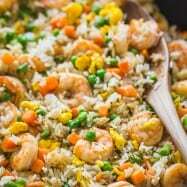 Plate the rice and sprinkle each bowl with some chopped green onions and sesame seeds if desired and serve warm. Here's an easy and yummy lunch idea: pineapple fried rice. 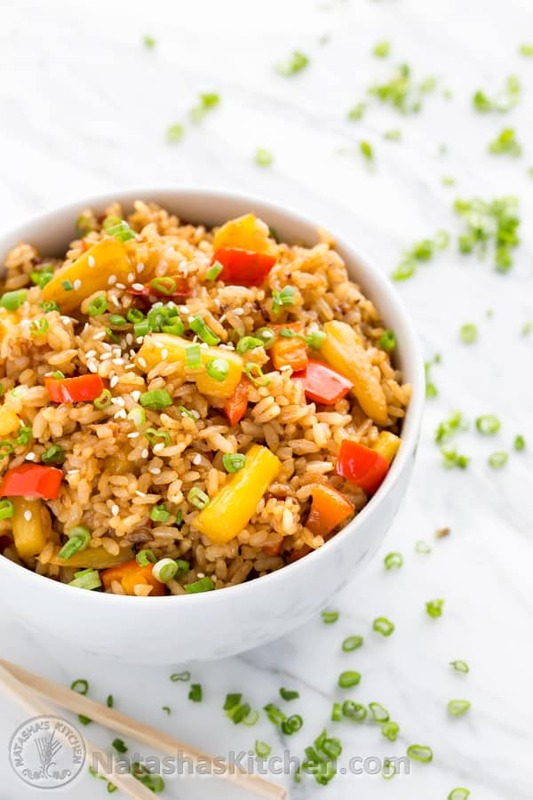 It is a great way to put some sparkle in your leftover rice. I'm a big fan of fried rice. Cooking over higher heat seals in all the natural flavors of the pineapple and leaves your rice with a subtle crispness. 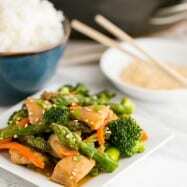 This stir-fry is a great meatless choice and everyone in my family loved it! Once your food hits the stove, it's done in under 10 minutes. Quick and easy! Rinse rice thoroughly and cook according to package instructions. We used a rice maker and added 1 Tbsp butter and 1/4 tsp salt then let it cool completely. This works best with cooled, leftover rice. Don't use warm or hot rice or it will get sticky. Prep your vegetables before firing up the stove. You won't have time to chop between steps. 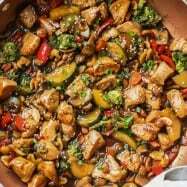 Heat a heavy-bottomed skillet or wok over medium heat, then swirl in 2 Tbsp oil. Add diced onion and cook about 1 minute or until softened. Next toss in pressed garlic and grated ginger and saute another minute, stirring constantly. 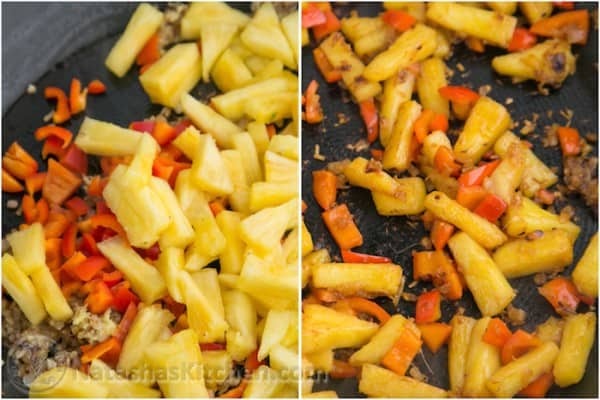 Increase heat to med/high and add diced bell pepper with pineapple and continue to saute everything for 3-5 minutes or until golden, stirring frequently. Add 2 cups cooked rice and 2 Tbsp of soy sauce, or to taste. Continue to stir over the heat another minute or until soy sauce is well blended in. Turn off the heat stir in 1 tsp sesame oil, or to taste. I love how sesame oil. It gives Asian-inspired meals authentic flavor. Plate the rice and sprinkle each bowl with some chopped green onions and sesame seeds if desired and serve warm. 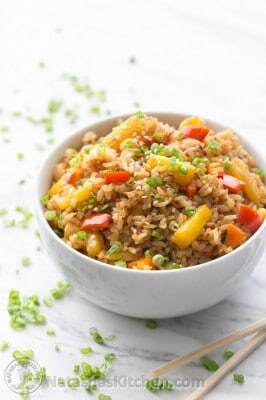 I bet this fried rice would be nice with a brown rice too. Have any of you tried it that way? P.S. Have a great weekend! Have any fun plans? What a wonderful recipe! 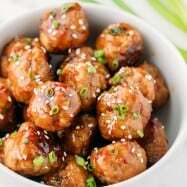 I’m always looking for simple recipes as I’m not able to spend much time on my feet due to a back injury. I purchased a fresh pineapple this week and was so excited to come across this recipe. Absolutely perfect combination of ingredients and the serving size was just right for two. Definitely a keeper! Thank you, I look forward to making, and eating, this one again. As does my husband! You are too cute! Who else says “put some sparkle in your leftover rice”? Seriously adorable!